Vs. Konnan & Rey Mysterio Sr.
Steiners Introduce Ted Dibiase As Mgr. NWA first, as Scott is still wrestling in the CWA. The majority of the matches on this volume are in “Good” quality. 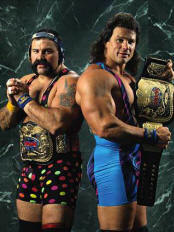 Rick & Scott are now both in the NWA and their careers begin to merge together as they begin their run as a tag team. 16. Steiner Brothers v. Mike Rotunda & Kevin Sullivan (Great American Bash 7/23/89 - Texas Tornado match. Scott to wait for him in the limo. Scott gets in, and is beat up by two thugs who eventually become known as Doom.